The Gallbladder is an elongated pear-shaped sac, with about 30-50 ml of capacity. It does the work of storing and concentrating the bile and eliminating it in the duodenum by its muscular contraction. Certain Radiopaque materials that are excreted in the bile are also concentrated in it. To show radiographically (cholecystography) the cavity of gallbladder and its ability to concentrate and contract, they are utilized. 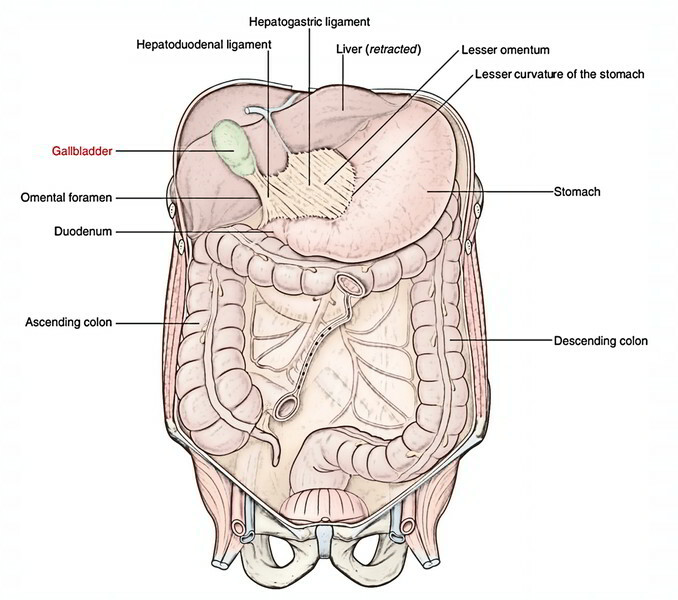 The hormonal constraint of gallbladder emptying: When the food rich in fat enters the duodenum, the duodenal cellsliberate a hormone referred to as cholecystokinin (CCK). This hormone is taken to the gallbladder and causes its contraction. There’s a reflex mediation, when the gallbladder contracts, the sphincter of Oddi relax. Hence concentrated bile is emptied into the gallbladder. The gallbladder is located in the fossa for gallbladder on the inferior outermost layer of the right lobe of the liver along the right border of the quadrate lobe. It stretches from the right extremity of porta hepatis to the inferior border of the liver. It’s normally connected to the liver substance by connective tissue and has venous communications with it. But it could possibly be suspended from the liver by a short mesentery, or partially buried in it. Width: 3 cm (at its widest part). The gallbladder is split into the following 3 parts: fundus, body, and neck. It’s the enlarged blind end of the organ. 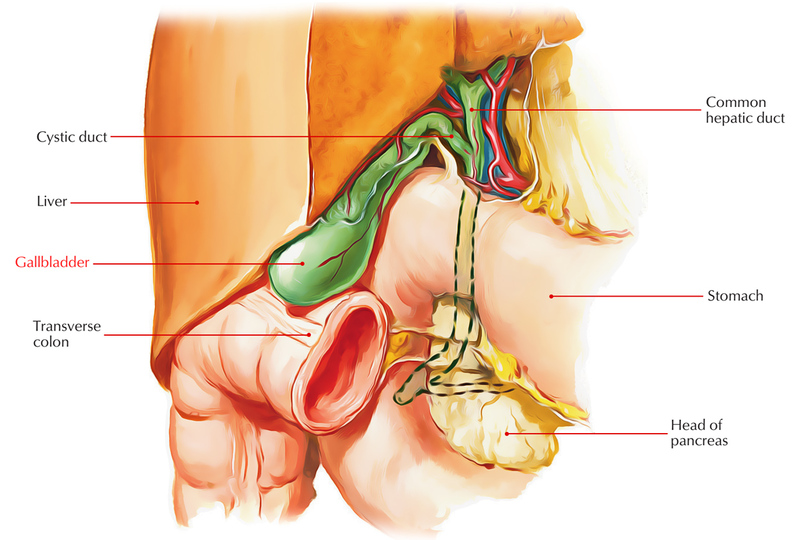 It projects from the inferior border of the liver and contacts the anterior abdominal wall in the tip of the right 9th costal cartilage, deep to the point where the right linea semilunaris meets the costal margin. It’s entirely encircled by peritoneum. It’s connected anteriorly to the anterior abdominal wall and posteriorly to the transverse colon. It’s constant via the body of the gallbladder together with the narrow neck. It’s pointed upward, backward, and to the left to join the neck in the right end of the porta hepatis. Its upper surface is connected directly to the liver and is devoid of the peritoneum. Its undersurface is covered by the peritoneum and is associated with the 2nd part of the duodenum. It’s the narrow upper end of the gallbladder being located near the right end of the porta hepatis. It joins the cystic duct and its junction with this particular duct is marked by a constriction. It’s connected to the liver by loose areolar tissue where cystic artery is embedded. It’s associated inferiorly to the initial part of the duodenum. Its posteromedial wall reveals a pouch like dilatation (Hartmann’s pouch) directed downward and backward. The gall stones lodged in this pouch might cause adhesion with the very first part of the duodenum and might perforate it. The neck turns sharply downward to eventually become constant with the cystic duct. Serous layer of the peritoneum. Subserous layer of the loose areolar tissue. Fibromuscular layer of the fibrous tissue blended with smooth muscle fibres, that are ordered in loose bundles disposed in longitudinal, circular, and oblique ways. Mucous membrane is loosely joined with the fibrous layer and is elevated into tiny rugae which give it a honeycomb look. The epithelium lining is made up of single layer of tall columnar cells. The gallbladder is supplied by the cystic artery (a branch ofright hepatic artery). 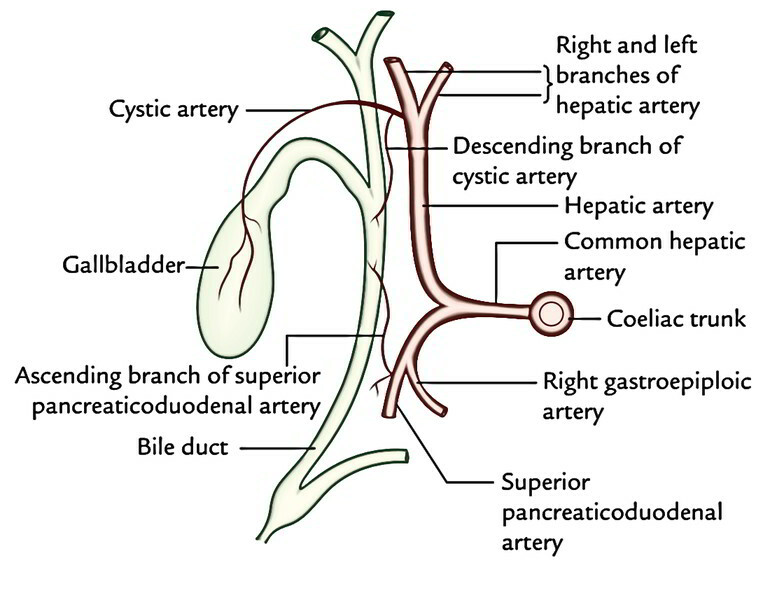 It might originate from the primary trunk of the hepatic artery, from the left hepatic artery, or from thegastroduodenal artery. The bulk of lymph vessels from the gallbladder drain into (a) the cystic lymph node of Lund, found in the Calot’s triangle and (b) the node alongside the upper part of the bile duct (node in the anterior border of epiploic foramen), which eventually drains into the coeliac group of lymph nodes. Few lymph vessels from the upper surface of gallbladder directly convey with subscapular lymph vessels of the liver. Cystic node is continuously enlarged in cholecystitis. The gallbladder gets its Nerve Supply via cystic plexus created by the sympathetic fibres (T7 T9), parasympathetic fibres (left and right vagus nerve), and fibres of the right phrenic nerve. Medically, gallbladder pain is referred to (i) the inferior angle of the right scapula by sympathetic fibres, (ii) the tip of the right shoulder through the right phrenic nerve, and (iii) the stomach by vagus.